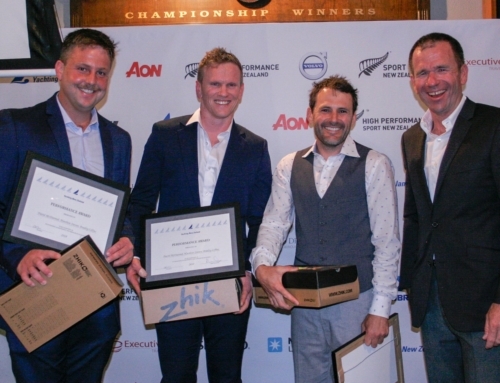 Day 1 of the 2017 18’ Skiff New Zealand Championship, hosted by Royal Akarana Yacht Club, provided the sailors perfect racing conditions on Auckland’s Waitemata Harbour. 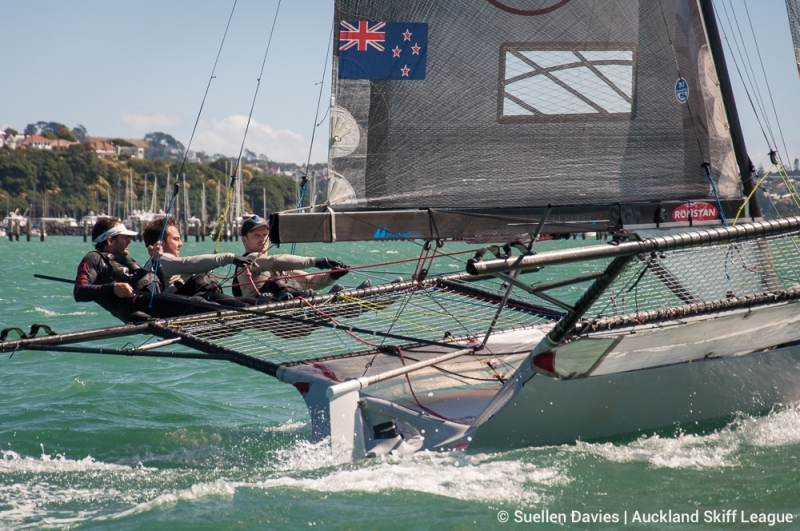 Being Waitangi weekend, there were plenty of recreational boats enjoying the day, which also gave the fleet the perfect training environment for the final regatta before heading to Sydney to compete in the JJ Giltinan Championship on Sydney Harbour at the end of February. 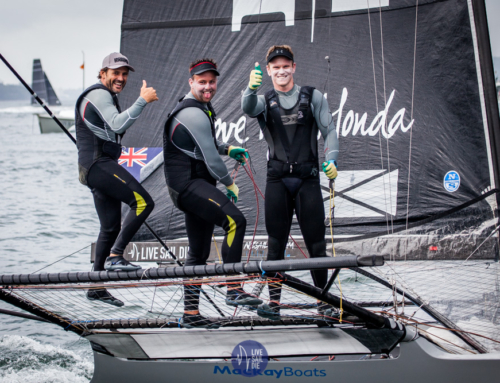 Favourites going into the regatta, Yamaha, skippered by Dave McDiarmid with Matt Steven and Brad Collins, once again showed they have what it takes, however Maersk Line definitely kept them on their toes. “Maersk Line had an awesome day today. They kept up honest passing us up the windward leg of race two on two occasions,” said McDiarmid. The day saw Yamaha hitting their strides early in race one battling it out with the Riley Dean skippered Kight Frank, up the first beat. C-Tech skippered by Alex Vallings went right early leaving Yamaha to concentrate on Knight Frank which paid for Valings pulling into second at the top mark in the 10-15 knot Sou-Wester. Graham Catley on board Maersk Line had a slow start capsizing at the top mark for the first time whilst in forth. The fleet spread out over the following two windward leewards with Yamaha constantly pulling away which was exacerbated over the predominantly starboard favoured windward leg up to Orakei buoy. Maersk Line made good in roads into third placed Knight Frank but could never pull back the Yamaha and C-Tech. Race two saw C-Tech pushing hard for the boat end at the start being a little to close for the starters liking and getting picked up for being on course side early meaning a bail out and re start by Vailings. Knight Frank nailed the start and put themselves in a good position for the first upwind leg. Maersk Line, starting well to leeward looked deep off the line. 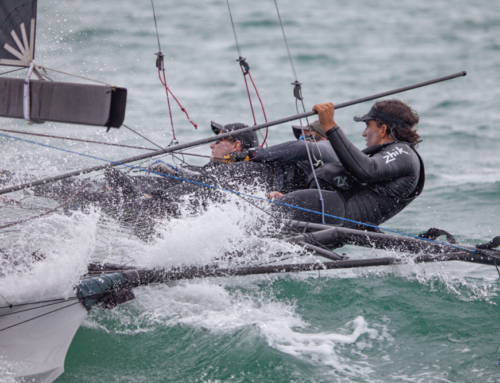 They did have something up their sleeves though – their upwind speed which they showed off brilliantly in race two. Maresk Line powered through the fleet and sat in first at the top mark for the first of two windward leewards. Yamaha, who also returned at the start under the impression they too were over, worked miracles to pull around the mark in second before skilfully flying to leeward of Maersk Line with a better set and rounding to take first. Maersk Line again showed their power on the second upwind to take back the lead but Yamaha, once again, showed what their slick crew work was capable off quickly getting back passed Maersk Line to claim their second win of the day. Unfortunately for the crew of Knight Frank, they managed to rip their kite halyard through their rig ending their day on the water and starting their afternoon on the ramp fixing their gear. Race three, the final of the day, was a harbour course consisting of a triangle, windward leeward, triangle. C-Tech and Yamaha were tied together of the start with C-Tech on Yamaha’s windward hip. It was not long before Yamaha was squeezing them out. Maersk Line picked up a clean start further down the line with ASCC following in his wake. It did not take long for Yamaha to put the hammer down with a good 30 boat lengths back to second placed C-Tech by the first wing mark. Maersk Line followed the precision in third with ASCC and AON Black chasing up the pack. Yamaha had a one-minute lead at the bottom of the course at Rough Rock and then headed into the lee of North Head where they had been working all day to their advantage. C-Tech, who was in second finally seemed to be clicking and made massive inroads in the lead of Yamaha to end up right back in contention going into the third upwind leg but it was not meant to be. The race was shortened on the third upwind at the top mark with Yamaha claiming the win, C-Tech second and Maersk third. Racing continues on Sunday 5th February with another three races before the fleet packs their boats into containers ready to head to Sydney.